Rebecca is a 28-year-old mother of six. Every morning, she wakes up early to get her children ready for school, prepare food for her husband, and go to the field. For a long time, Rebecca’s family lived in a precarious situation. They did not have enough food to feed the whole family and only two of the five children were able to go to school. Unfortunately, Rebecca's husband does not work. He gets up early to stay under the mango trees chatting with others and sipping the local beer, leaving Rebecca to be the sole breadwinner for the family. Their relationship was strained. "I had the obligation to prepare food for my husband, I was afraid he would marry a second wife to punish me," Rebecca said sadly. The relationship with her husband is not the only thing worrying Rebecca. South Kivu province, where Rebecca lives with her family, has suffered inter-ethnic armed conflicts that have plunged the local populations into poverty. Despite the obstacles and threats, the women of the region have not given up. Like Rebecca, they are working hard to make better lives for themselves and their families. In March 2016, Rebecca enrolled in the Women for Women International year-long program to learn life and vocational skills. Apart from her favorite lessons on health, Rebecca also learned about women's rights, savings and earnings and baking. She is part of a group of 25 women who work at a bakery twice a week and share the profits. The stipend money Rebecca receives from the WfWI program has helped her enroll two of her children in school and join a local savings group in her village. Rebecca worked very hard but she just wasn’t earning enough. 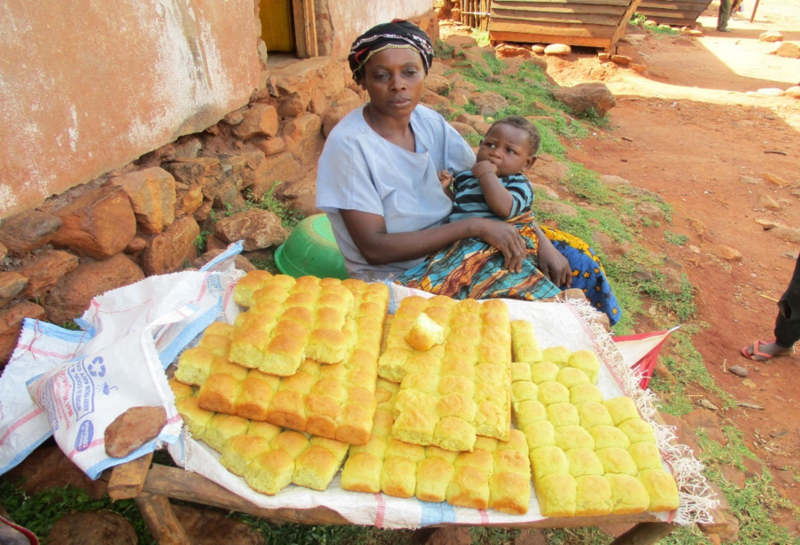 She decided to become an entrepreneur and borrowed from her local savings group to pay for ingredients and start producing bread. She set up her business on the main road where there is a lot of vehicle traffic. Her bread was selling out fast! Two months later, she was able to repay the loan she had taken out and provide school fees. At home, Rebecca’s family no longer struggles to eat. "I've already saved 25,000 Francs and I have those breads you see here. I know that after sale I would still have a profit!" she said. With support from Women for Women International, Rebecca has overcome poverty and wants to go further. "My biggest wish is to save more money and build my own oven to increase the production of bread. This will allow me to continue paying school fees to all my children,” she confidently states. Rebecca says that besides her private business she will continue to work with others in the group because she appreciates their support and continues to learn from them.